VinCork® Rubberised cork Washers are obtained from die punching the VinCork® rubberized cork sheets into various forms and sizes as per customer design. Its usage saves time, material wastage and labour of consumers as it is available in pre-packed kit form. Pristine Technologies & Industries Pvt.Ltd. We also offer VinCork ™ washer of different sizes as per Industry requirement. These are available in both circular & rectangular shape for gasketing of bushings, oil gauge, radiators and conservators etc. 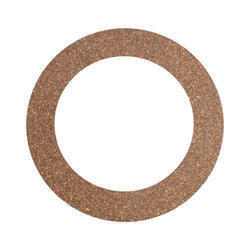 Cork Washers, Size: 1/32" To 1/4"
We are offering Cork Washers to our clients. Aimed at prosperous growth in this domain, we are instrumental in manufacturing an excellent quality range of Cork Washer. - It provides lower clamping force during operations. With a firm commitment to quality, we are involved in offering a wide ambit of Metal Washer. Cork Washer Set M12 19pec. 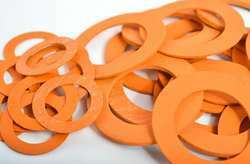 We are manufacturer for all type of Cork Washers and Gaskets as per sizes and Drgs. This Washers and Gaskets are made from best of cork sheets available for the Transformer & Electrical Industries. This Round Cork Washer is processed with high quality material which makes it high in strength and easy to install in transformer. We are a most trusted name in between the topmost companies in this domain, instrumental in offering Rubberized Cork Washer. Our product range is available in different sizes and shapes according to the requirements of the customers. This Rubberized Cork Washer is checked for quality under varied set norms of the industry.